This adorable project was available in magazines during the release of Tinker Bell’s latest DVD and is great rainy day project. Cut two small “X” shaped openings on both sides of your bottle. Push your stick through one opening and out the other for perches. Cut out two small feeding holes about 2 inches above each perch. Punch a hole at one end of your bottle using your nail. Thread your string through the hole and tie off for hanging. Fill the bottle with bird seed or finely chopped nuts. 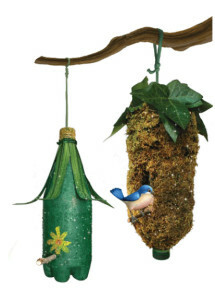 Find a bird-friendly place to hang your feeding station. See how many birds come to visit! 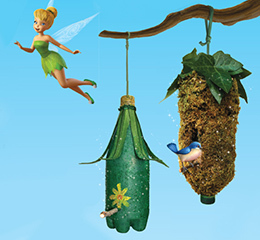 Now that you’ve made your bird feeder it’s time to decorate Pixie Hollow style! 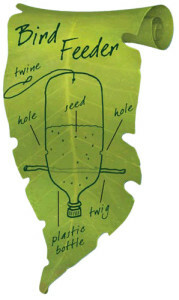 You can use paint, glue, leaves and moss to make your bird feeder look like it came right out of a fairy tale! Don’t forget to add some pixie dust! Note: Make sure the items you use can not be removed or eaten by the birds who use it.